AC 91, FIN 743, Jan 19, 5A, upper mattress. Had my extractors to pull teeth to get the comp sheet, again. I wonder, has anyone contacted AC maybe via twitter asking why they have to do battle for a compensation sheet every time their seat resembles a morgue slab / pancake? Yup...I complain publically via Twitter. AllI get is "DM us your details". In fact, with my last complaint, they thought I was referring to a previous complaint as to two deflate occurrences happened so close together. I think they should gamify this and just issue punch cards. After 10 deflated seats, you get a free set of Roots sweats. - "Earn Your Sweats 2019". mamau, flyquiet and 24left like this. Commission Roots to make sweats with padding down the back or side (back sleeper or side sleeper models). Bohemian1 and canadiancowfarmer like this. Thank you for your email. 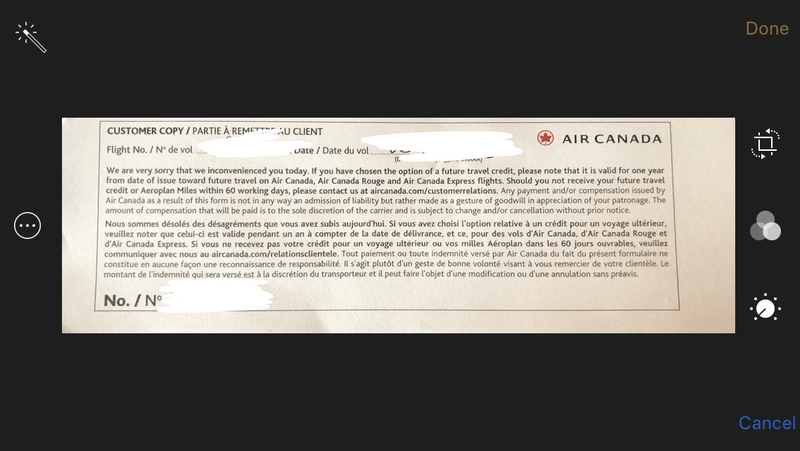 We appreciate your continued customer loyalty and apologize for the discomfort you have experienced on more then one occasion due to your Business Class seat not inflating properly. I am pleased to have the opportunity to address this concern. We recognize that our top tier customers look forward to the additional comforts of their Business Class seats. I am very sorry that on multiple occasions your comfort has been negatively affected by the seat not inflating properly. Please know that our operations managers are aware of this issue and our Cabin Engineering team is working with the aircraft manufacturer on a more permanent solution to the seat inflation issue. We apologize for letting you down on these occasions. Are you a SE? Reason I ask is I like your post and it's very helpful but I take huge offense at this comment: "our top tier customers look forward to the additional comforts of their Business Class seats"
Do us statusless or non-SE peons not deserve the additional comfort of Business Class?! Other than that, good on you for writing in and hopefully AC will actually follow up with their in-flight team. If SDs are actively refusing to provide these forms for whatever reason that is, in my mind, a disciplinary offense. Yes SM. No matter, E35k or any recognition of loyalty at all should get the same treatment when it comes to a paid seat that is defective...mandatory if is a known problem, which it is. The trend of great concern here is that it is harder and harder to get these compensation sheets. I had a similar situation where the SD clearly didn't give a *&%$# about me or the seat and did not offer up a form. Rather than get into a scrap, I sent a pretty pointed email to AC, calling him out by name but being careful to: a) state my side of the story as clearly as possible, b) communicate how it made feel as a customer and about AC's brand in general and c) stating up front (and in closing) exactly what I wanted. It took a while, but I got a response (different enough from yours not to be simply bolierplate) and I got what I wanted. The inconsistent manner in which AC's onboard staff is dealing with this simply takes a bad situation and makes it worse. Whether it's a distorted view of what customer service truly is, or simply bad communication/training, I do not know. But nor should I care. Last time I checked, I'm the one paying for the service, one which is publicly promoted as an "end-to-end premium travel experience ". Which all too often it is not. 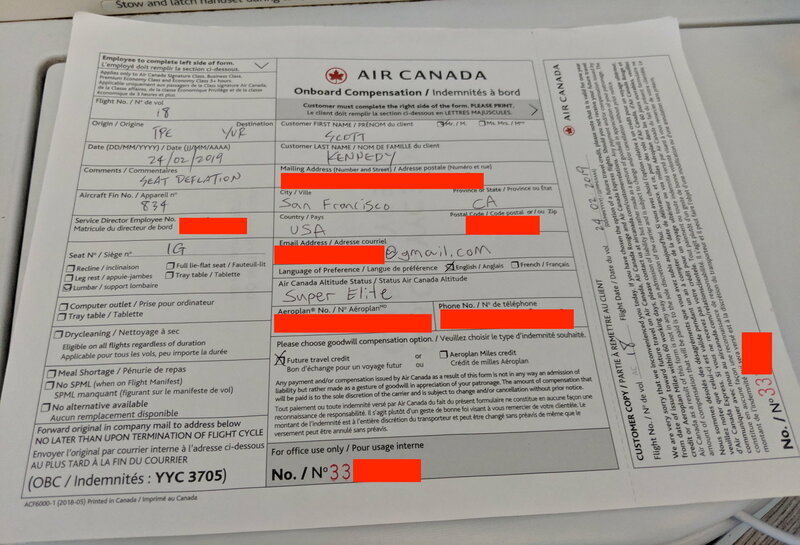 So, like you, on future flights I will be very firm about asking for a comp form onboard and will also take the Ruminant's advice on making it the GA's problem should the seat fail my pre-flight testing during boarding. If AC won't make the extra effort to serve me, I will make the extra effort to ensure that I am served. Getting one out of some SDs is like pulling hens teeth. Yea, as if the compensation is coming from their pay checks. I had a similar problem on a flight in Nov where my wife's seat deflated (mentioned upthread). The FA dismissed her and said she was playing with the buttons and walked away. I had to walk to the other side of the plane and interrupt the SD to get it fixed, and it was ultimately resolved. Someone pinged me on my somewhat obtuse use of the word "ruminant" above. Sorry to be have incited a “Dude, Where’s My Cow?” reaction - it’s Friday, it's been a long week not travelling for once and I’m getting bored of using the same words over and again. My sincere apologies to the Canadian Cow (tm). While I am at it, my apologies also to the Ghanian Goat, Danish Deer, Andalusian Antelope, Sinaloan Sheep and any other related critters on FT. I cud name more, but I won’t. wrp96, canadiancow and WaytoomuchEurope like this. Decided to cancel my two YYZ-HND bookings and do YYZ-ORD-NRT on ANA. Just not worth the risk, especially when covering a relative to fly J for their first time. I had a similar problem on a flight in Nov where my wife's seat deflated (mentioned upthread). The FA dismissed her and said she was playing with the buttons and walked away. This is what sealed the deal for me. What a joke. Plumber and D404 like this.